Everyone has their own reasons for starting a business. Some are passionate about an idea and want to bring it to life. Some are motivated by the profit potential. Others are lured by the lifestyle it allows you to have – being your own boss and being able to control your own time. None of these was the motivation of my latest interview guest, Fred Magnanimi. Fred’s jewelry company and family business, Luca + Danni, was inspired by tragedy and pushed on by fate. Fred’s family had been in the jewelry manufacturing business for over 60 years. The company, which was started by his grandfather, manufactured religious jewelry and sold their products to wholesalers. Business was good up until the turn of the century when manufacturing started to move overseas. By the time Fred was a young adult, his father was running the business, and his youngest brother Danny was training to become the next CEO. Fred himself wanted nothing to do with it. In the interview, he tells me that he “swore off the family business” and instead chose a career in investment banking. In May 2012, everyone’s lives changed. Danny was diagnosed with leukemia and fought a hard battle for 11 months. His mother sat by his bedside every day while he was in treatment and Fred visited frequently as well. During that time, he learned about Danny’s passion for the family business and his desire to save the company. In April 2013, Danny passed away. The stress of the situation led Fred’s father to become ill. With no one to take over the family business, it looked like the company was doomed. Fred quit his job, moved to Rhode Island and made a pledge to save the family business. “The first year that I was in the jewelry business, there wasn’t a day that I didn’t want to quit.” To say that Fred was an unlikely entrepreneur is putting it mildly. Fred admits that he didn’t know what he was doing and wasn’t enjoying himself either. He started looking for jobs in investment banking again. But fate had other plans. When Fred started watching jobs go to less qualified people, he knew it was a sign to push on. He began to view his lack of experience in business and manufacturing as a good thing. He could be objective and look at things with a fresh set of eyes. He could find outdated processes and identify what things weren’t making money. He had fresh ideas and, as he mentions in the interview, “I was here for a reason, and cancer really changed my life.” He wanted to leverage the manufacturing facility to really tell the story, building a business that was bigger than just a place where they make jewelry. And so Luca + Danni was born (named after his children – his son Luca and his daughter Stella, who was born just before Danny’s death and was given the middle name Danni in his honor). The new company utilized the factory to make trendy handmade wire-wrapped bracelets, and Fred also changed distribution methods to sell the products online and in stores. 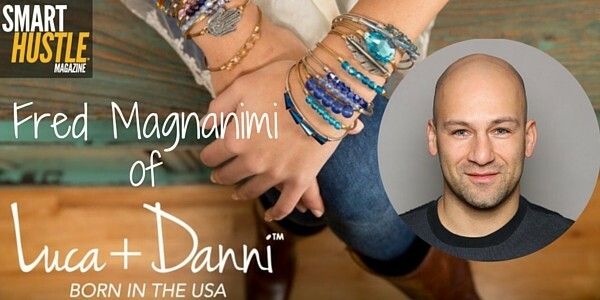 Luca + Danni products are now carried in 900 stores, and they also have a booming e-commerce business. With sales in the millions and the pride of creating a Made in the USA product, Fred has embraced the title of business owner. See why @lucaanddanni CEO stepped into the family #business & how he found success in a new era. When I asked Fred about his advice for other business owners, he says that business owners need to embrace technology and the world we live in. “Never in the history of business have you been able to reach so many people so quickly, so cost-effectively.” Through websites, e-commerce platforms, and social media, today’s business owners have more opportunities than ever before. This advice comes from Fred’s own experience. As we mentioned, Fred changed distribution methods in a business that used to sell to wholesalers. Some people in his factory still reflect on the good old days when sales were made in person and deals finalized with a handshake. While he still relies on his veteran workers’ experience to help him problem solve, his fresh perspective allowed him to explore the technological possibilities for sales. Fred himself set up his first website and social media pages. As he mentions in the interview, today’s technology is a lot more accessible than many people assume. Every business owner should embrace technology, even if (or especially if) they have to jump start it on their own. In our discussion of whether you should take a DIY approach or hire a consultant for things like setting up a website or running social media, Fred says that when you are just starting out, the DIY approach can be beneficial. Setting up an online presence is all about creating a culture and a brand identity. Doing it on your own forces you to think about these things and to really know who you are as a business. Fred uses the Shopify platform, and he says every business owner is capable of using the DIY method. Once they become more established, they can hire a consultant or a dedicated staff member for these duties.